Skeptics, Humanists Come Together in Tacoma in First Joint Conference: Skepticism, Humanism, or Both? Here are the remarks by CFI President and CEO Ronald A. Lindsay at the CFI Summit in Tacoma presenting the organization’s Lifetime Achievement Award to Eugenie C. Scott. Back from the CFI Summit, I am completely impressed. Not only was there no obvious twerking, but there was no drama, and in our tight little community of scientific skeptics that is a wonderful thing. The 2013 scary movie The Conjuring was very loosely based on the story of Roger and Carolyn Perron and their five daughters who moved into a “haunted” Rhode Island farmhouse in January 1971. There, hysteria soon reigned, the flames of which were fanned by the infamous paranormal “investigators” Ed and Lorraine Warren. The Houston doctor Stanislaw Burzynski has been using an unproven cancer cure, “antineoplastons,” for decades, but despite its lack of proven anticancer activity, he has still not been shut down. Here is a primer for skeptics on his career and claims. 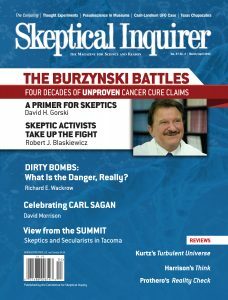 A group of skeptical activists has been aggressively investigating and challenging the false claims of the Burzynski clinic and its dubious cancer treatments, presenting reliable information about them online. They even raised funds for a legitimate research hospital. What Is the Danger That Terrorists Will Attack the United States with a Nuclear or ‘Dirty’ Bomb? A review of Think: Why You Should Question Everything, by Guy P. Harrison.